The old team-sports clichés include “Attack starts at the Back”. This cliche is none more suited than to the latest name on the defensive roster of the 2018/19 Belfast Giants, Guillaume Gélinas. The 5’9″ d-man arrives on Queens Island off a championship year with HC Banska Bystrica of the Slovakian Tipsport Liga. A quick skater, he thrives on the powerplay and is quick to jump into the rush. Drafted into Val-d’Or Foreurs in the QMJHL Entry Draft in 2009, Gélinas spent 4 years in western Quebec, picking up a host of awards in his final season that included the QMJHL title and the Emile Bouchard Trophy as defenseman of the year. He was key to the success of Val-d’Or that year, which became all too apparent in the 2014 Memorial Cup. A shocking knee from Guelph Storm’s Chadd Bauman in the round-robin felled Gélinas and earned Bauman a suspension that would keep Storm D-man from the Final. Thankfully for Val-d’Or and Gélinas early concerns of something serious were dispelled as it was little more than a charley horse. The knock did keep him from the final vital round-robin game against Edmonton Oil Kings, but his teams valiant double overtime victory set up a rematch in the Playoff round Semi Final. Gélinas returned for this game, if somewhat gingerly and rescued the match in the dying seconds. With the Oil Kings leading 3-2, Val d’Or pulled their nettie and with 36s left in regulation Gélinas found an open seam and leveled proceedings. The Oil Kings would eventually win the game 4-3 in triple OT, marking the longest game in Memorial Cup history, but Gélinas would walk out the story of the match following an inspirational performance. There was no luck in the NHL Draft for the young québécois d-man, many citing him as an “undersize” player in that role, but 2 goals in the Minnesota Wild Development Camp furthered the already heightened attention of the NHL team and he was to sign his first pro-contract with Minnesota as an undrafted free agent. 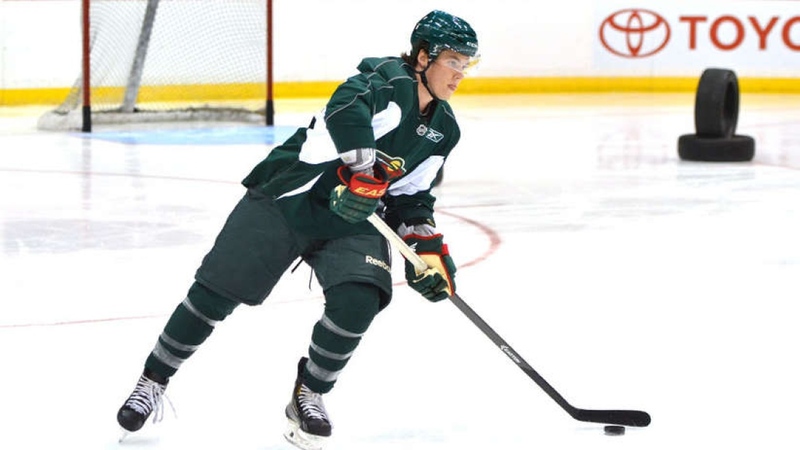 The Wild assigned him to their AHL affiliate in Iowa where he spent a season with limited ice time on their blueline. It was a difficult season in Iowa, they missed the playoffs and finished last in their division. The next couple of seasons in North America Guillaume spent split between the AHL and the Wild’s ECHL team, Quad City Mallards. As always the competition for places in the AHL is high and after 2 years competing, his promise at ECHL level didn’t translate to a consistent place in the AHL, so Gélinas took the decision to move on. He was selected in the 2017 LNAH draft, however rather than take the place with Trois-Rivieres, he hopped on a flight to Europe and a solid season led to his first professional league title. He now joins Belfast to complete the defensive roster. A skating offensive d-man with an abrasive style and want for time in the powerplay. He certainly has the potential to put the numbers up at the EIHL level. His cameo in the CHL and European experience will give him the head start when it comes to the Giants participation in this years Continental Cup. He certainly has the potential to shine and at 25 years old is another young gun in Adam Keefe’s arsenal.